** The View From Olympus: Asleep on the Beach? The Trump Defense department is dominated by Marines. The Secretary of Defense, James Mattis, was until recently a Marine General. His number two, Deputy Secretary of Defense Robert Work, as a Marine captain was one of my students in the seminar that put together maneuver warfare for the Marine Corps. The Chairman of the JCS, General Joseph F. Dunford Jr., is a Marine, as is his J-5 (Strategic Plans and Policy), Lt. Gen. Frank McKenzie. All these Marines were exposed to maneuver warfare and military reform from their earliest days in the Corps onward. As the best the Marine Corps has produced, it is reasonable to think they are readers of serious military history and theory. General Mattis is notably so. So why are we hearing nothing about military reform from any of them? So far, all the Trump administration has done in defense is add $54 billion to the budget to do more of what has not worked. Friends inside the Pentagon say it’s all just business as usual. There has not been so much as a hint of reform, a word about leading all our armed services toward Third Generation maneuver warfare. It is not as if a well-developed agenda for military reform is lacking. That was put together in the 1980s, and most of it is relevant, mainly because we have remained as firmly stuck in the mud of Second Generation war as we were then. It begins with setting the basic components of military strength in the right order: people, ideas, and hardware. So far, DoD’s Marine leaders have continued to put hardware first with people a long way second and ideas invisible. Aadhaar is a winner, the biggest killer-app India has designed in the modern age. We can’t let go of this advantage we created by blundering into it. Despite misgivings in many quarters, especially about the security of the biometric data collected by the Aadhaar project and the possibility of abuse of privacy when the scheme is put to many uses by the government, the overall reality is that India has pulled off a coup of the kind seldom seen before. Aadhaar, which now has the biometric data of over a billion Indians, is comparable to the kind of success achieved by Google, Apple, Facebook, Alibaba and Amazon. Even though it is a project pushed down many unwilling throats by government using unfair means, including the coercive power of a weak state, having gotten this far it makes more sense to seek benefits from it than to diss it. Aadhaar is the greatest technology platform created by India, and the reason why one can compare it to Google or Facebook is simple: technology platforms enable the creation of growing networks that ultimately create huge value. The world over, platforms have valuations that are several times that of pure technology companies, because once users, software developers and companies start building their own usage and business models around you, you acquire enormous power. Nobody can say today that they won’t develop an app for Apple or Android, unless they don’t want to succeed in business. Tomorrow, using our billion-user database, India can insist on mobile phone companies and other platforms burning Aadhaar-authentication capability directly onto their hardware and software. It is our leverage with the Googles of the world, which are enormously powerful in the world of technology. With Bangladesh Prime Minister Sheikh Hasina finally making her long-awaited state visit to India next week, there is already much discussion about how the bilateral relationship can be taken to the next level. Some have suggested focusing on the development of the Bay of Bengal region; others have urged that seemingly intractable diplomatic challenges such as the Teesta river water-sharing agreement be resolved first. There have also been reports of a defence deal as well as agreements to boost trade, transit and energy security. Surprisingly, the issue of radical Islamist terror, which has been gaining ground not just in Bangladesh but also in West Bengal, has received limited attention, even though counter-terrorism has been one of the biggest success stories of the bilateral relationship. For many years, New Delhi’s primary concern with Dhaka was anti-India elements using Bangladeshi territory as a safe haven. On the one hand, militants from the North-East took advantage of the porous border to slip away from Indian security agencies. On the other, there were radical Islamist groups such as Harkat-ul-Jihad al-Islami Bangladesh (HuJI-B) and Jamaat-ul-Mujahideen Bangladesh (JMB) that sought to foment trouble in both countries. Stone-pelting is back in the news with the Budgam encounter on 28 March which killed one militant but left 43 CRPF and 20 Police personnel injured. According to reports, stone-pelting terrorist supporters obstructed the security forces operations in an attempt to enable the militants to get away from the scene. Three stone pelters were also killed in police firing while some 17 were reportedly injured during the operation. This was by far one of the heaviest stone-pelting incidents in recent times, but certainly, more is yet to come. Simultaneously, the Supreme Court has asked the Centre to explore an alternative to pellet guns to control protesters in Kashmir and also take action against parents of minors who are used as shields by militants during attacks on security forces. Ever wondered why there are no stone-pelting protests in Pakistan or China, or even in Balochistan and Xinjiang? The explanation is simple: In Pakistan, such individuals will simply be killed. Any reporter, who attempts to factually report the incident, too will simply cease to exist. China, for example, gained a worldwide fame for mowing down unarmed students (not even holding stones) at Tiananmen Square in 1989. But, what about India? Are we not a soft state to allow Pakistan’s ISI play the game of cat and mouse and have a ball in Jammu and Kashmir while also exploiting the social media to incite the public at will? An interesting debate is taking place in India on the future of its nuclear doctrine. A number of factors have added a new sense of urgency to this debate – a center-right government in New Delhi that is not shy of dramatically recalibrating Indian foreign and security policy combined with growing concern among Indian strategic thinkers over Pakistan’s reliance on tactical nuclear weapons, as well as Pakistan-China collusion. These factors are rapidly closing India’s room for maneuverability and an ongoing power transition in the Indo-Pacific whereby the Trump Administration is indicating that it may not be averse to new nuclear powers emerging in Asia hasn’t helped. The group lacks one key asset: popular support from the Afghan people. The Taliban insurgency has entered its 16th year in Afghanistan, but their prospects for control of the country are as gloomy as they were when the group was toppled in 2001 by a U.S.-led international coalition for refusing to hand over Osama bin Laden, the mastermind of the 9/11 attacks. Despite considerable Pakistani support, a massive drawdown of foreign troops from Afghanistan, and crippling corruption in Afghan governmental organizations, the Taliban are not in a position to overthrow the democratic regime in Kabul. Part of the explanation is the international support for the Afghan government, but the most important and yet mostly overlooked reason for the Taliban’s quandary is the lack of broad national support for their cause. The history of Afghan resistance movements clearly indicates that their successes against former empires and conquerors were indebted to the popularity of and broad national support for uprisings against the invaders. Although at times international support and recognition – such as during the Soviet invasion – played an important role, it was still secondary to the nationwide Afghan resistance that sustained and protracted the bloody campaigns, making it impossible for the invaders to win. Pakistan, according to experts, can now be classified as a stable economy in view of its comparatively strong macroeconomic indicators. The country’s economic performance, along with China’s investment into the CPEC initiative, has encouraged investors to look at the country in a new light. Such is the dominance of geopolitical narratives in South Asia that any positive news from the neighbourhood does not reach us. While thinking about our neighbours, especially Pakistan, images of a country whose economy is in shambles and polity unstable strike us. Not that these images have changed completely, nor has Pakistan moved on to become a developed economy overnight, but the changes in the neighbourhood are significant. The country now has the potential to transform itself into a stable polity and healthy economy pending a good deal of caution. Stephen Chen had a March 29, 2017 article in the South China Morning Post, about “China’s efforts to lure scientists back [to the mainland] from overseas institutions have been paying off militarily — with more than a little help from the United States”. “Military projects they [these scientists/engineers/researchers] have been involved in [after returning to China]– include the development of hypersonic weapons which can penetrate missile defense systems; and, the design of new submarines able to patrol quietly along the U.S. West coast,” according to researchers familiar with these programs who spoke to the publication. Mr. Chen notes that Beijing has placed increased emphasis on luring the best and brightest researchers back to China for over a decade; and as placed particular emphasis on recruiting scientists working at [research] laboratories in the U.S. linked to America’s nuclear weapons program. and other [sensitive] military research, as well as those working for NASA, and leading U.S. defense contractors such as Lockheed Martin Space Systems, and Boeing Aerospace. The bankruptcy of Westinghouse Electric Co., the Pittsburgh-based nuclear power company, is a geopolitical setback for the U.S. It halts a long-standing U.S. effort to get Eastern European countries to buy U.S. rather than Russian fuel, and leaves state-controlled Russian and Chinese companies the dominant suppliers in the huge global market for nuclear technology. Nuclear power is unfashionable and environmentalists everywhere hate it, but it's the most efficient carbon-neutral energy technology currently available. Nuclear plants produce power in 31 countries, supplying 11.5 percent of global electricity needs; 11 countries depend on nuclear power for 30 percent or more of their electricity, 10 of which are in Europe. Bulgaria, the Czech Republic, Finland, Hungary and Slovakia use Russian-made reactors; the latter two countries are installing more of them. These reactors use Russian fuel, providing a sizable revenue stream to Russia's state-owned Rosatom, the world's biggest exporter of nuclear technology. A kilogram of enriched uranium, enough to power 33 average American homes for a year, costs about $1,900. At first glance, many of the technological innovations sprouting in China are replicas of similar systems in the West. For instance, bike-sharing was created in Europe and then diffused to other parts of the world, including China. Now bike-sharing in China has exploded over the last year, and at least two companies are attempting to bring Chinese-style bike-sharing to the United States, a fascinating example of what some call reverse innovation, writes Karl Ulrich, vice dean of entrepreneurship and innovation at Wharton, in this opinion piece, which was adapted from an essay Ulrich recently published on Medium. But what is different about the Chinese system and how might it fare in the U.S.? The Flying Pigeon bicycle is the most popular vehicle model in human history, with more than half a billion units deployed. Yet, bicycle use in China had been in steady decline since the 1990s. Indeed, the aspiration of most city-dwelling Chinese has been to own a car, which has contributed to clogged streets and air pollution in first-tier cities. Remarkably, bike-sharing may spell the return of the bicycle in China. Six months ago, few shared bicycles were on the roads and there were just a few promising signs of adoption. Today, about 500,000 shared bikes are in use in Beijing, with similar penetration in other first-tier cities. At least five separate companies are vying for dominance. Users are crazy about the service. Traffic and subway lines are noticeably better. I’ve never seen adoption of a hardware-based service happen so quickly. What explains this remarkable early success and what does the Chinese experience imply for other cities? Will Central Asia Water Wars Derail China's Silk Road? It wasn’t until the second century BC that ancient China arguably discovered the true potential of Central Asia’s geostrategic golden ticket. As the then-reigning Han Dynasty set out to formally establish a network of trade routes crisscrossing the region, later christened as the Silk Road, it realized that the Eurasian gateway was the perfect conduit to carry its political, economic, and cultural influence to the eastern frontiers of the Roman Empire, the present day Middle East and South Asia. Combined with marine routes of the time, the Silk Road not only became an important passage for subsequent Chinese rulers to trade in spices, silk, and slaves but also helped them exchange news ideas in science, arts, religion, literature, and crafts. Almost 700 years after the decline of the ancient trade network, China, in its modern avatar as the world’s second largest economy, is aspiring to replicate that old glory and influence through a revival of its historical Silk Road. And once again it has turned to its old neighbors and allies in Central Asia to capitalize on the region’s geostrategic advantage. The new reincarnation, known as the Silk Road Economic Belt or SREB, is China’s prodigiously bold economic ambition to connect with potentially 40 countries across Europe, Asia, and Africa. The vast economic corridors and infrastructural network, when fully functional, will potentially give China unprecedented access to 60 percent of the world’s population and a third of global wealth. It’s an audacious plan for a country that now clamors for unquestionable global clout. Part One of this series examined the state of renewable energy in China and the connections between civilian and military industry partners. Part Two looks in detail at the PLA’s developing energy strategy both on the mainland and, increasingly on offshore islands at the center of territorial disputes. Delivering his work report to the National People’s Congress, Chinese Premier Li Keqiang noted that “the Chinese mainland will resolutely oppose and contain ‘Taiwan independence separatist activities’” (“台独”分裂活动) (Xinhua, March 5). President Xi Jinping, however, was even more explicit in early November 2016, when he said “1.3 billion Chinese people will oppose Taiwan independence. We have the ability, the determination and are prepared to deal with Taiwan independence. If we do not, we will be overthrown (推翻) by 1.3 billion people” (Apple Daily, November 2, 2016). China’s ability to “deal” with Taiwan involves political and economic pressure. These tools have already seen some success as the number of countries that recognize Taiwan shrinks, and Taiwan’s participation in international organizations is severely restricted. However, as China’s military becomes more effective, military coercion is increasingly a viable option. 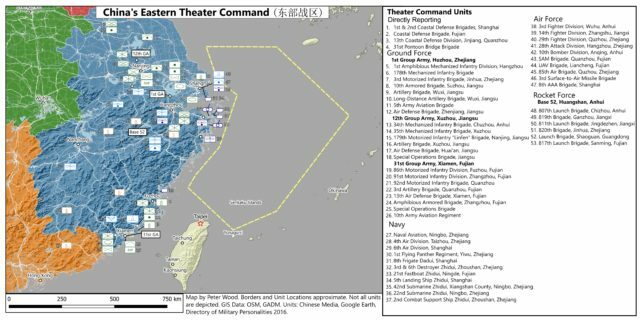 An overview of China’s Eastern Theater Command (ETC) provides some insight into the Chinese military’s current capabilities against Taiwan. At a sumptuous lunch in Beirut, my friends were debating whether Israel would invade Lebanon. One, a member of parliament, believed the United States and Saudi Arabia were giving a green light to Israel to crush the armed forces of Hezbollah once and for all. Another disagreed, arguing that Israel was content to let the Lebanese militant group bleed on the battlefront in Syria. The others weighed in on one side or the other. I knew the debate. I had heard it over and over in 1972 when I moved to Beirut for the first time. Nothing has changed. Well, almost nothing. Then, Israel's enemy was the Palestine Liberation Organization. Now, it's Hezbollah. Apart from that, it's the same old fear: Israel. And it's the same prospective victim: Lebanon. Since 1972, Lebanon has endured many Israeli invasions, Syrian occupation, government collapse, 15 years of civil war, and the assassination of its better politicians, journalists and activists. Yet it blunders on. The war that began in 1975 ended in 1990, and the country has been rebuilding in fits and starts ever since. The arts are flourishing. New technology companies are blossoming. Women's rights groups are standing up to the rickety male power structure. Students are demanding modern governance. Campaigners are fighting ubiquitous corruption. Cafes hum with talk of politics and potential war, but also of new businesses, the arts, cinema, fashion, pop divas of transcendent vulgarity, phone apps and social media trivia that would embarrass a 13-year-old in the San Fernando Valley. Beirut, whatever its flaws, is never dull. Britain's Royal Navy is substantially weaker than it was during the Falklands War but could still "cripple" Spain, military experts have said. Rear-Adml Chris Parry, a former director of operational capability at the Ministry of Defence, has called on the Government to "appropriately" invest in Britain's military capacity if it wants to "talk big" over Gibraltar. It came as a former Tory leader suggested that Theresa May would go to war with Spain to defend the sovereignty of the peninsular just as Margaret Thatcher did with the Falklands. Lord Howard said the Prime Minister will stand by Gibraltar during Brexit talks amid claims of an EU “land grab” for the territory. As the Government moved to retake the Falkland Islands from Argentina in 1982, the Royal Navy had no fewer than 127 ships — including 60 destroyers and frigates and a dozen nuclear attack submarines - as well as two major amphibious ships and three aircraft carriers. Chairwoman Ernst, thank you for holding this important hearing and thank you to our witnesses for their testimony on Russia’s use of influence activities and unconventional warfare in the so-called “grey zone” that encompasses the struggle between nations and other non-state actors short of direct military conflict. This hearing builds on the testimony the Full Committee received last week on the security situation in Europe. At last Thursday’s hearing, General Scaparrotti, Commander of U.S. European Command, stated that Russia is using a range of military and non-military tools to “undermine (the) international system and discredit those in the West who have created it.” When I asked him about Russia’s conduct of denial, deception and disinformation operations, General Scaparrotti stressed that Russia takes not only a military approach but a “whole of government” approach to information warfare, to include intelligence and other groups, which accounts for its rapid and agile use of social media and cyber. Russia’s use of the full range of political, economic, and informational tools at its disposal provides it the means to influence operations in the grey zone short of a direct conventional war. Last week, the White House released its FY 2018 budget blueprint, adding $54 billion in defense and national security spending, while proposing massive cuts to foreign assistance and multilateral funding. This budget—justified as necessary to keep America safe—will do the exact opposite. It repeats the same mistake made by many Republican and Democratic administrations: a failure to understand that security and prosperity in the United States depend on the vitality of democratic institutions, including civil society, around the world. Instead, the budget reflects a deeply held and largely debunked notion that security and human rights are in competition. For decades, despotic governments have sought to limit freedoms of expression, association, and assembly—among other rights—in a bid to maintain power. Following the color revolutions in Eurasia and the Arab Spring in the Middle East and North Africa, in which mass mobilizations of citizens toppled firmly entrenched leaders, governments intensified their crackdowns on civil society. Using various approaches—ranging from controlling the media, conducting smear campaigns, and passing restrictive legislation to depriving human rights activists of their nationality, detaining civil society leaders, and in some cases, engaging in targeted killing—authoritarian and semi-authoritarian governments, as well as fragile and emerging democracies, have attempted to silence independent voices. The fear of foreign interference and citizens’ demands for democratic reform have led governments to put constraints on the work of civil society organizations and their interaction with international organizations, foundations, and donors. In places such as Ethiopia and Russia, these restrictions on foreign funding have decimated the human rights sector, creating a vacuum filled by government-affiliated organizations. WASHINGTON -- Army officials on Saturday announced it will soon field a personal fitness bracelet that will allow Army leaders to track their Soldiers' fitness in real time. The technology will enable Army leadership to monitor their Soldiers' activity level, physical location, and intake of foods, liquids, and other substances. It also allows leaders to provide remote mentoring in real time, according to Dr. Duke McDirkington, the lead scientific advisor from the U.S. Army's Research Institute of Environmental Medicine, or USARIEM, and the co-chair of the Army's Physical Training Belt Task Force. "We know for a fact through scientific research and polls that Soldiers already love the 'PT' Belt," McDirkington said. "But they have demanded a device like this that would allow their leaders to send corrective guidance when the system detects a caloric spike due to things like junk food." The congressionally-mandated joint task force of USARIEM, and Program Executive Office, or PEO, Soldier, has spent seven years developing the device, which is embedded in a reflective, elastic wristband similar in appearance to the PT belt. Like their dog tags, Soldiers will wear the new fitness tracking device at all times. The federal government has made “significant progress” in its efforts to shore up cybersecurity at civilian agencies after suffering numerous high-profile breaches in recent years, but there’s still room to do more, Department of Homeland Security Acting Deputy Undersecretary for Cybersecurity Jeanette Manfra told the House Homeland Security Committee on March 28. Manfra reported on progress across broad initiatives, including improving agency cybersecurity, establishing a common baseline of protection and codifying roles and responsibilities to effectively manage cybersecurity risks and incidents. Manfra said DHS views cybersecurity and IT modernization initiatives as opportunities to make “generational advances in capabilities,” which echoes President Donald Trump’s early draft executive orders covering the dual objectives of cybersecurity and IT modernization. The executive orders have not been enacted, though a final version is expected eventually. In its proposed fiscal 2018 budget, the Trump administration has requested $1.5 billion from Congress for DHS to secure federal IT infrastructure. Cyber criminals are aggressively sharing credentials to .edu email accounts — including stolen accounts, fake emails, and older e-mail accounts. The Digital Citizens Alliance saw evidence showing threat actors of all types — including hacktivists, scam artists, and terrorists — putting credentials (e-mails and passwords) up for sale, trade, or, in some cases, just given away. Rankings showing the total number of stolen credentials for the 300 largest university and college communities found within dark web sites. Stes selling Higher Education Institutions (HEIs) credentials on the dark web. These emails include those stolen from faculty, staff, students, and alumni, as well as criminals who have created fake emails. (L-R) National Counterterrorism Center Director Nicholas Rasmussen, Federal Bureau of Investigation Director James Comey, Director of National Intelligence James Clapper, Central Intellegence Agency Director John Brennan, Defense Intelligence Agency Director Lt. Gen. Vincent Stewart and National Security Agency Deputy Director Rick Ledgett testify before the House Permanent Select Committee on Intelligence at the U.S. Capitol February 25, 2016 in Washington, DC. Clapper said that the group known as the Islamic State, or ISIS, has become a greater global threat than al-Qaida ever was. SAN FRANCISCO (Reuters) – When WikiLeaks founder Julian Assange disclosed earlier this month that his anti-secrecy group had obtained CIA tools for hacking into technology products made by U.S. companies, security engineers at Cisco Systems swung into action. The Wikileaks documents described how the CIA had learned more than a year ago how to exploit flaws in Cisco’s widely used internet switches, which direct electronic traffic, to enable eavesdropping. Download a PDF file of "U.S.-India Insight March 2017"
India’s deficit in goods trade continues to decline. The country’s goods trade deficit for Fiscal Year (FY) 2017 will likely reach around $105 billion, down from $118 billion in FY 2016 and $137 billion in FY 2015. India is thus poised to have consecutive years of a strengthening balance of goods trade for the first time since the 1991 reforms. International businesses hope that this trajectory results in the Narendra Modi government warming up to trade integration. In the three years prior to the Bharatiya Janata Party’s (BJP) victory in the 2014 national elections, India’s goods trade deficit averaged around $170 billion per year, with a peak deficit of $190 billion in FY 2013—around 12 percent of India’s GDP at the time. This worsening trade position strengthened the hands of senior policymakers in the Manmohan Singh government who were already reluctant to pursue deeper trade integration, resulting in a slowdown of India’s global trade negotiations and the establishment of domestic manufacturing requirements in a range of sectors. MARCH 27, 2017 MONTREAL—As a teenage hacker in the early 1990s, David Mirza Ahmad quickly learned that even the savviest techies can be "owned," old-school computer slang for exposing someone's identity. After Mr. Ahmad tangled with rival hackers on a local online message board, they discovered his name and quickly found out his phone number at his parent's home in Calgary. They called him from a payphone down the street, and posing as cops, threatened to press charges for his digital trespassing. It was just a prank, but for Ahmad, who immediately ripped up his printouts and destroyed his floppy disks after the call ended, it provided a wake-up call that eventually led him to pursue a career in security research. Over the past 25 years as he taught himself the ins and outs of breaking computer programs, he became increasingly aware that the systems that people trust with their most sensitive information are inherently untrustworthy. On a larger scale, the experience with his online foes in early internet forums isn't all that different from what millions of people experience today when cybercriminals break into their emails or take over social media accounts and expose their personal and financial details. “All of these anxieties have been scaled up,” he says. The importance of secure computing, “is sort of catching up with everyone,” he adds.